Two probationers are in custody today after Elk Grove Police noticed a suspicion vehicle located behind a local business that led to their arrest. Just before 11 p.m last night police officers noticed the vehicle located behind a business on the 8800 block of Calvine Road. 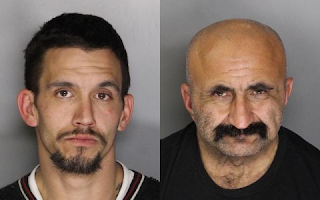 When officers approached the vehicle, Mark Anthony Maestas (above right), 51, of Elk Grove and Geoffrey Haenggi(above left), 32, of Sacramento, were observed walking away from the vehicle when Maestas allegedly dropped bolt cutters. Both suspects were detained and a records check revealed that Maestas was on probation and Haenggi had an active arrest warrant. A probation check of Maestas led to the discovery of a controlled substance. The pair was arrested and booked into the county jail where they remain in custody. Both men are scheduled for arraignment of Monday, February 6.